(Nanowerk Spotlight) There seems to be an arms race going on among nanotechnology investment and consulting firms as to who can come up with the highest figure for the size of the "nanotechnology market". The current record stands at $2.95 trillion by 2015. The granddaddy of the trillion-dollar forecasts of course is the National Science Foundation’s (NSF) "$1 trillion by 2015", which inevitably gets quoted in many articles, business plans and funding applications. The "nanotechnology market" as a unified market was first quantified by the NSF in its massive 280-pages report from March 2001 (Societal Implications of Nanoscience and Nanotechnology). The problem with these forecasts is that they are based on a highly inflationary data collection and compilation methodology. The result is that the headline figures - $1 trillion!, $2 trillion!, $3 trillion! - are more reminiscent of supermarket tabloids than serious market research. Some would call it pure hype. This type of market size forecast leads to misguided expectations because few people read the entire report and in the end only the misleading trillion-dollar headline figure gets quoted out of context, even by people who should now better, and finally achieves a life by itself. Today, there isn't even a clear definition of what nanotechnology is. The CRN blog covered this confusing picture quite nicely in a recent post. But taking every product that has anything to do with nanotechnology, however miniscule or remote, adding up the entire value chain of these products, and claiming this is "the market for nanotechnology", isn't very helpful either. On the contrary, it contributes to the confusion: first we are told how revolutionary nanotechnology is going to be (think molecular nanosystems such as nanorobots). Then we hear that actually there is quite a discussion going on among experts as to when or whether it's going to happen. And now we read that nanotechnology will be an almost three trillion dollar market within the next 8 years! First of all, these market size forecasts are dealing with what is called evolutionary nanotechnology. The goal of evolutionary nanotechnology is to improve existing processes, materials and applications by scaling down into the nano realm and ultimately fully exploit the unique quantum and surface phenomena that matter exhibits at the nanoscale. This trend is driven by companies' ongoing quest to improve existing products by creating smaller components and better performance materials, all at a lower cost. Just look at what happened in the computer industry over the past 20 years; and by definition of the nanotechnology research analysts, because chip design structures have broken the 100 nanometer range, the semiconductor industry is on its way to becoming a nanotechnology industry. Due to this ever continuing trend of "smaller, better, cheaper," the number of companies that are, by the same definition, "nanotechnology companies" will grow very fast and soon make up the majority of all companies across many industries – and they will have familiar names such as Kraft, L'Oreal, Toshiba, GE, BMW, Nokia or Bayer. By contrast, truly revolutionary nanotechnology envisages a bottom-up approach where functional devices and entire fabrication systems are built atom by atom. There is no way today to put a market value on this visionary technology and its hypothetical products and it is therefore not covered in any of the nanotechnology market size reports. 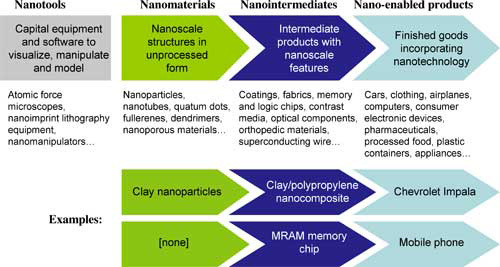 Breaking down the market size figure into nanomaterials, nanointermediates, and nano-enabled products shows that actual nanomaterials contribute less than 0.5% (this share is so small that it doesn't even show up in the above chart - which of course now you can no longer see because Lux Research forced us to removed it). Lux Research estimates the market for pure nanomaterials (carbon nanotubes, nanoparticles, quantum dots, dendrimers etc.) to grow to approx. $3.6 billion by 2010 (from $413 million in 2005). In comparison, the Lux forecast for the entire "nanotechnology impact" by 2010 is roughly $1,500 billion. In 2000 the National Science Foundation estimated that the market for nanotechnology products will be over one trillion US dollars by 2015 and that the industry would employ over 200 million workers. These numbers have been subsequently quoted from funding applications to government policy documents, but at the halfway point many of the revolutionary and disruptive technologies predicted have failed to emerge. Indeed, seven years on from the inception of the National Nanotechnology Initiative, there appears to be little sign of a nanotechnology based industry, although significant amounts of R&D are being undertaken by various industries. Then the report goes on to estimate the "Global Nanotechnology Market" by 2015 as $1.5 trillion excluding semiconductors and $2.95 trillion including semiconductors. Somewhere in the text of the Cientifica report is this key sentence: "It should be noted that this is not the total value of nanotechnologies included in products, but the total value of the products. Thus a tenth of a gram of nanomaterials costing 10 cents may be included in a drug costing $100 per dose." Just to be clear here: this means that the nanotechnology market size, as compiled by Cientifica and others, includes the $100 for the entire drug dose, not it's actual 10 cents nanomaterial ingredient. In this example they are therefore expanding their definition of "market" by a factor of 1,000 simply by including the entire product's value, not just the nanotechnology component in it. This methodology is then consequently applied to all industry sectors. If you were to research the U.S. market size for, say, color pigments, i.e. various organic and inorganic particles such as carbon black or iron oxide, you would come up with a figure of about $2 billion to $3 billion per year. This is the actual value of pigments sold. Color pigments are used for a myriad of products such as paints and coatings, printing inks, plastics, ceramics, glass and minerals, textiles and leather, toner, cosmetics and toiletries, paper and paperboard. Now, if all these pigments were nanoparticles, the nanotechnology analysts would tell us that the market size of "color pigment-enabled products" was many hundreds of billions of dollars; because now they would include the end products that the pigments were used in. Nobody today claims that the market size for color pigments is hundreds of billions of dollars or talks about a color pigment-enabled market. But when the pigment size moves from the macro- to the nanoscale, some analysts would do exactly that – although apart from the pigment size nothing has changed. It is difficult to see the logic in this. There is an argument to be made that nanotechnology should not be looked at as a product industry but rather as a set of enabling technologies that supports many existing industries (basically applying the "nano" label to existing technologies – electronics, optics, composite materials, pharmaceuticals etc.). However, the nanotechnology analysts apply their magic trillionizer trick to this area as well. Let's say that a laboratory device for blood testing contains a microfluidic component and that component gets reduced in size to a nanofluidic device. All of a sudden, the market value for nanofluidic devices would not just be the value of the actual component but include the entire value chain of blood testing – because it is now "nanotechnology-enabled". Lux Research in a recent report ("Sizing Nanotechnology’s Value Chain") makes a similar stretching exercise as Cientifica by predicting a $2.9 trillion nanotechnology market by 2014. They correctly identify this number as "Sales of products incorporating nanotechnology". According to their example, the value of all Chevy Impalas – just because the car contains a component that contains nanoparticles – would be considered part of the nanotechnology market. That's got to be an even higher scale-up factor than the 1,000 for the drug in the Cientifica example. So what is the point of coming up with the market size for "nanotechnology-enabled" products? It's difficult to see the practical value apart from creating headlines that help sell these reports. If you want to convey the message that nanotechnology will revolutionalize many processes and products, there must be a better way doing that than generating eye-popping, headline-grabbing, trillion-dollar market size figures. Of course it helps tremendously in writing business plans and funding applications. It might be very useful in politically justifying the billions of dollars that have already gone into infrastructure and basic R&D. Unfortunately, it can also be abused for marketing slogans by the kind of investment advisors who push nanotechnology investments as a get-rich-quickly promise: "Wow, look - this company makes a new nano product/application/material/whatever. It is a player in a trillion dollar market. If they only get 0.1% market share that would be 1 billion dollars!" But seriously, what is the practical value of knowing the market size for nanotechnology-enabled products if soon almost everything will be nanotechnology-enabled (at least by the definitions used in the market sizing reports)? The recent Cientifica paper states: ... an enabling technology that supports other industries will not ever be considered a stand-alone industry.... Quite rightly so. So why then try constructing an artificial market for of a wide range of enabling nanotechnologies by adding up the value of all products that somehow benefit from these technologies? I guess the point I am trying to make here is that these trillion-dollar forecasts for an artificially constructed "market" are an irritating, sensationalist and unfortunate way of saying that sooner or later nanotechnologies will have a deeply transformative impact on more or less all aspects of our lives.